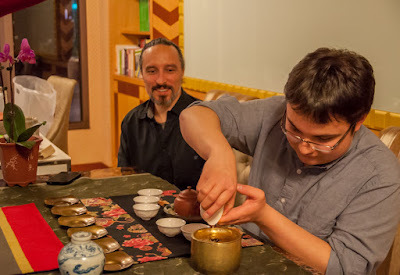 Tea Masters: Old and aged Oolong. What's the difference? Old and aged Oolong. What's the difference? For last week's tea class, we had special guests from the Tea Institute at Penn State: Ryan, Andres, Sam and Teddy who have a busy 2 weeks tea schedule in Taiwan. This last day of 2015 was a fitting time to look at the past and see what makes that a Oolong is old or aged. And since high mountain Oolongs are now the most popular style in Taiwan, I dedicated this class to the aging of these high mountain Oolongs. 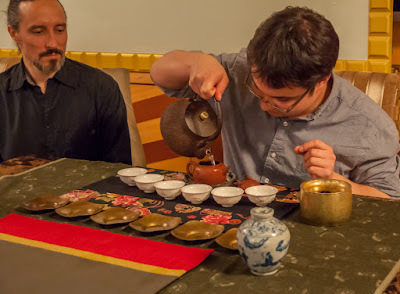 Before they became popular, most Oolongs used to be roasted like Dong Ding's Hung Shui Oolongs. These teas were very stable in terms of aromas. They were not considered old before at least 20 years of age. 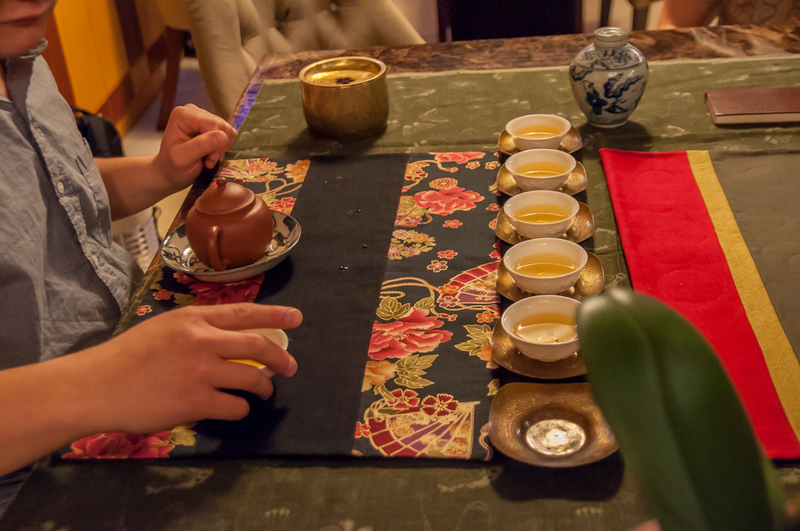 Nowadays, with fresh Oolongs, consumers consider these teas old after 1 year, once the new season is available. 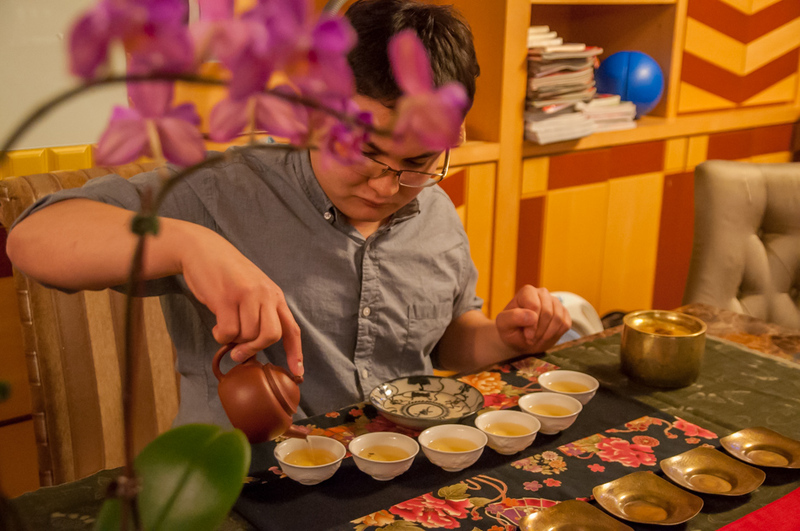 Everybody in the class has had the experience of a high mountain Oolong that turned sour and uninteresting within a year. But is this always true? Is it possible to age High Mountain Oolongs so that they improve with time? In our first experience, I made a blind tasting of my winter 2014 and my winter 2015 Da Yu Ling Oolong. Both are kept in vacuum sealed packages. Everybody thought that the winter 2014 was the freshest and better one, because it felt smoother and more refined than the 2015, which still had too much energy from its recent production! This shows that vacuum sealed Oolong can retain its freshness and improve when it's not exposed to air. There will be more change if the leaves are allowed to age in a jar. But is this change necessarily for the worse? 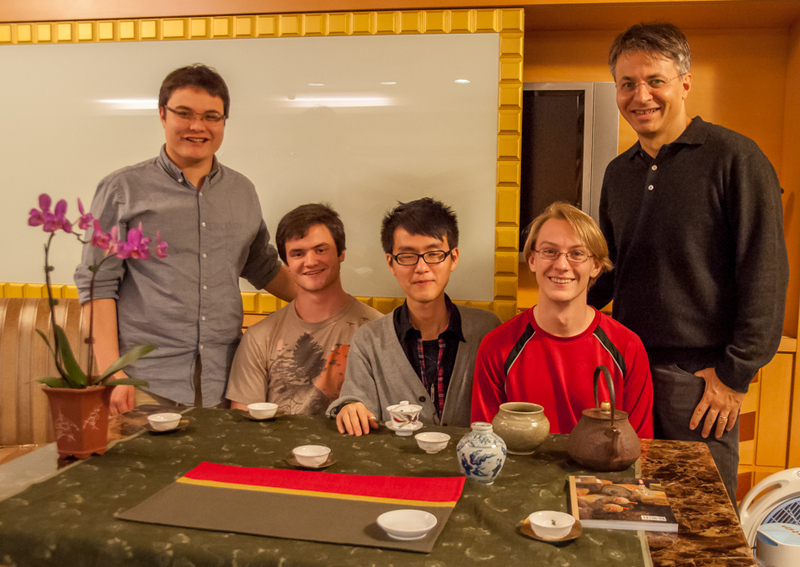 Let's find out with a tasting of my spring 2013 Qilai shan Oolong. 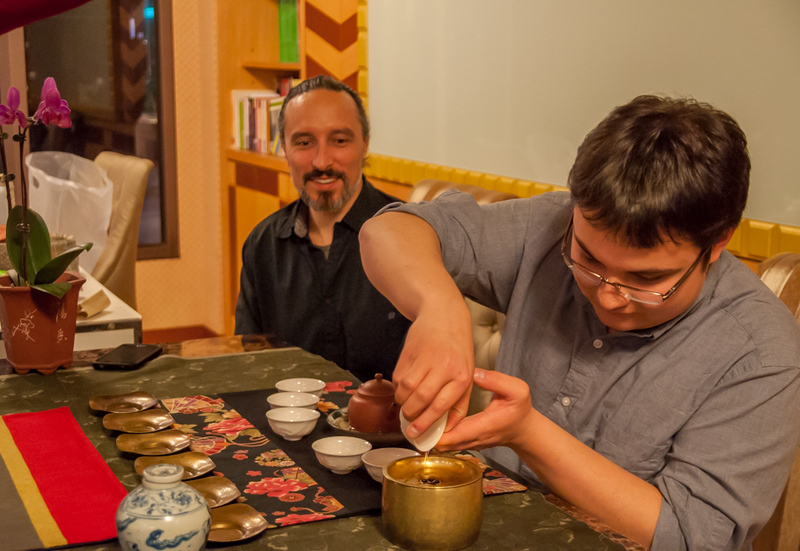 (It's a tea that Ryan has tasted in the past as you can see if you click on the previous link!) I have kept it for over a year in the qinghua jar seen in these pictures. The result was simply delicious. The freshness was still there, but not in aggressive, powerful way like in new Oolong. The aromas had matured a little bit, but didn't turn sour, because the sweetness was still dominating. There are 2 reasons this High Mountain Oolong could be aged (instead of turned old). First, the quality and energy of the leaves was strong enough when young. Secondly, it was well processed: sufficient oxidation level and thorough drying of the leaves. 'Nuclear green' Oolongs are not suited for aging. They will simply turn old and are best drunk ASAP! 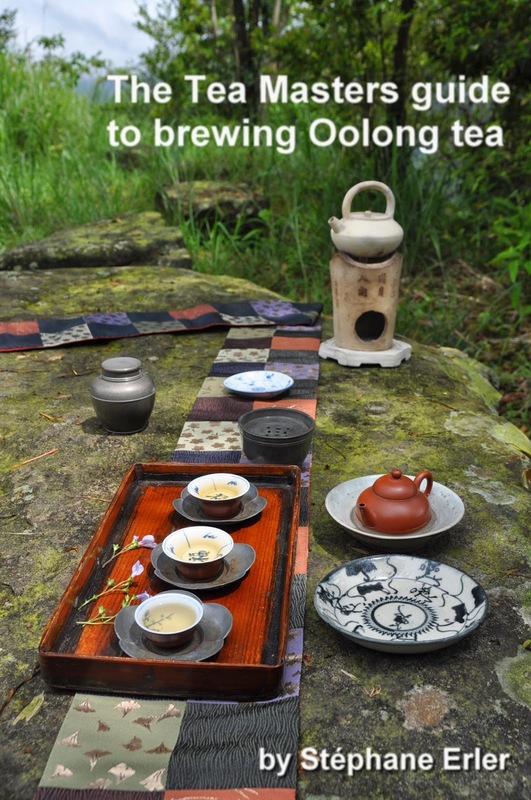 One of the safest approach for long term storing is to purchase high mountain Oolong with some roasting. It's not easy to find such tea, because farmers are often able to sell all their tea without bothering to roast them, but you can sometimes find some here! The question is then how to store the tea? To find out, we brewed the same roasted twinter 2007 Lishan Oolong stored in a porcelain jar and stored in a plastic foil (not vacuum sealed). We could first taste the stability of the aromas. At 8 years of age, it didn't yet have significant aged scents. The leaves from the jar tasted more complex, harmonious and aged. The leaves from the foil tasted a little bit fresher, but also less refined and not as interesting. 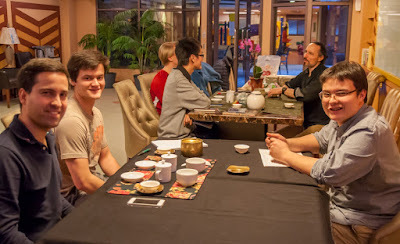 These 3 experiences already used up all our time, but I wanted to let everybody experience something amazing and so we went into overtime with a spring 1990 Qingxing Oolong from Cingjing (2000 meters, near Tsui Feng). Ryan performed the third brew and, since we used very few leaves, he must have brewed them for 10 minutes! The taste was honey sweet, silky and coating the palate. It also left a cooling feeling in the mouth and a very relaxing aftertaste. Tea heaven! An incredible High Mountain Oolong, 25 years of age and not a bit old!! 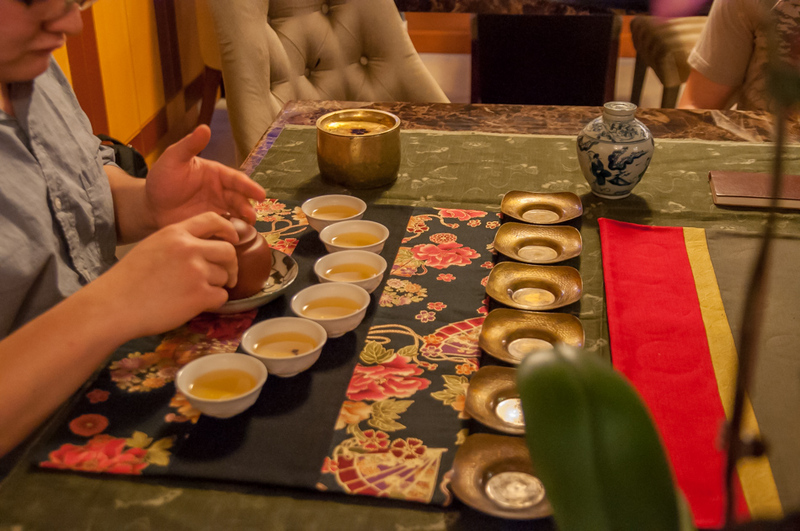 Conclusion: High mountain Oolongs also have wonderful aging potential, but the quality of their process is essential. 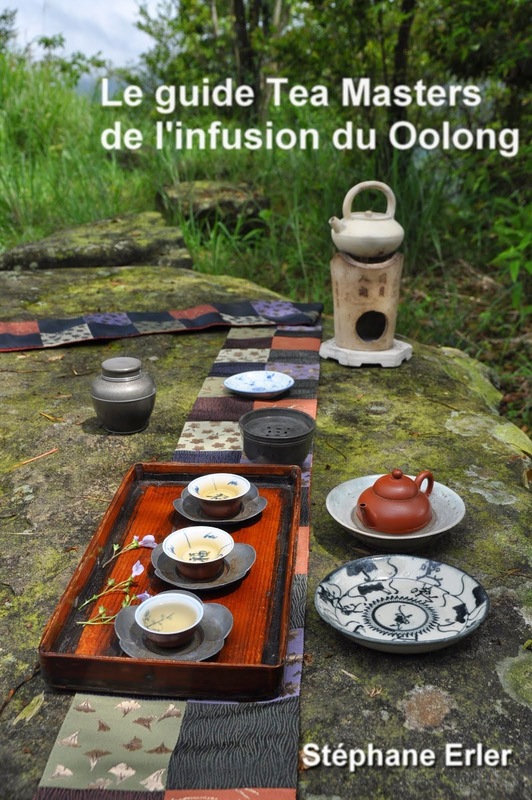 Currently, if you are looking to age high mountain Oolong, I would particularly recommend this Oolong from Fenqihu (Alishan) for its very light roast. Très interressante réponse à la question des thés de garde. Pour ce faire, tu préconiserais donc les jarre en porcelaine plus qu'une conservation en sachet ? Great article! Thank you for this experience Stephane. I don't think I've had so many aged oolongs in one sitting -incedible comparative tasting experience. It was the perfect way to end 2015.